Naproxen Sodium Overdose is the accidental or intentional intake of the drug in dosage higher than prescribed values. What is Naproxen Sodium Overdose? What are the Causes of Naproxen Sodium Overdose? What are the Signs and Symptoms of Naproxen Sodium Overdose? The signs and symptoms of Naproxen Sodium Overdose can vary from one individual to another. It may be mild in some and severe in others. Several systems of the body may be affected. How is First Aid administered for Naproxen Sodium Overdose? Who should administer First Aid for Naproxen Sodium Overdose? 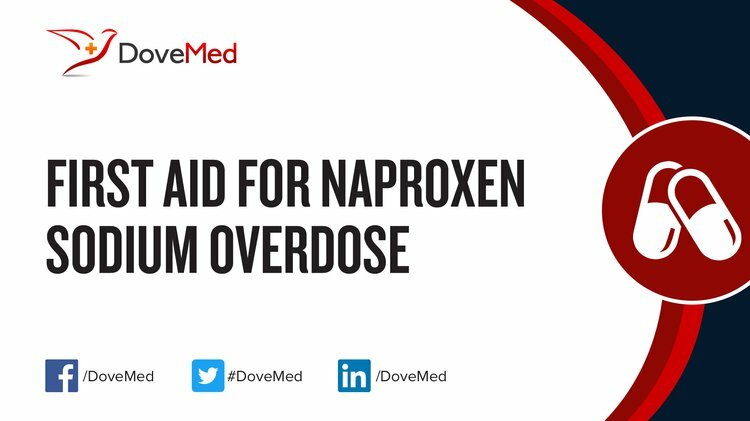 First aid for Naproxen Sodium Overdose is administered by healthcare professionals. What is the Prognosis of Naproxen Sodium Overdose? How can Naproxen Sodium Overdose be Prevented? McDonald, S. A., Hershey, A. D., Pearlman, E., Lewis, D., Winner, P. K., Rothner, D., ... & Derosier, F. J. (2011). Long‐Term Evaluation of Sumatriptan and Naproxen Sodium for the Acute Treatment of Migraine in Adolescents. Headache: The Journal of Head and Face Pain, 51(9), 1374-1387. Rothman, K. J., & Lanza, L. L. (2013). Estimated risks of fatal events associated with acetaminophen, ibuprofen, and naproxen sodium used for analgesia. Adv Pharmacoepidem Drug Safety, 2(124), 2167-1052. Sultana, N., Arayne, M. S., & Shahzad, W. (2010). Simultaneous Determination of Ceftriaxone Sodium and Non Steroidal Anti‐Inflammatory Drugs in Pharmaceutical Formulations and Human Serum by RP‐HPLC. Journal of the Chinese Chemical Society, 57(6), 1278-1285. Al-Abri, S. A., Anderson, I. B., Pedram, F., Colby, J. M., & Olson, K. R. (2015). Massive naproxen overdose with serial serum levels. Journal of Medical Toxicology, 11(1), 102-105. Farquharson, S., Shende, C., Sengupta, A., Huang, H., & Inscore, F. (2011). Rapid detection and identification of overdose drugs in saliva by surface-enhanced Raman scattering using fused gold colloids. Pharmaceutics, 3(3), 425-439. Herring, J. M., McMichael, M. A., Corsi, R., & Wurlod, V. (2015). Intravenous lipid emulsion therapy in three cases of canine naproxen overdose. Journal of Veterinary Emergency and Critical Care, 25(5), 672-678.